The small hammer candle that we saw on the daily chart for the usd to cad on Tuesday, failed to validate on Wednesday, with yesterday’s candle ending the trading session lower and with small shadows to both top and bottom. However, the speed of the downwards fall has certainly slowed over the last few days, suggesting that we may well see a pause, or some sideways consolidation at this level in due course. 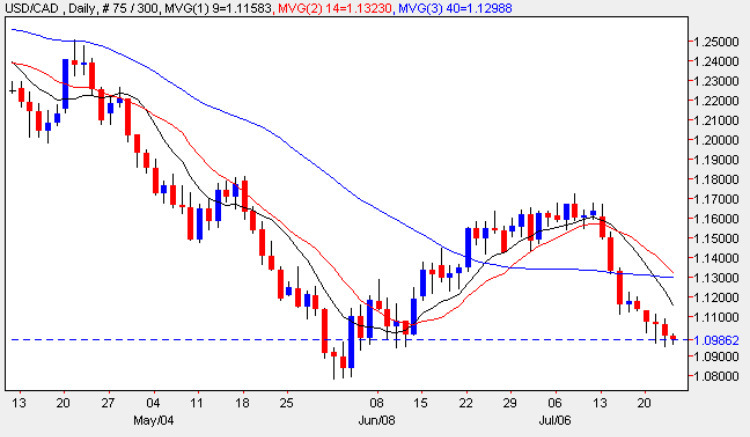 With the 9 day e moving average having crossed the 40 day, and with the 14 day average about to do the same, the picture still remain heavily bearish for the currency pair in the short term. The main fundamental news on the economic calendar for the US has already been released with the weekly Unemployment data coming in marginally worse than expected at 554,000, an increase of 30,000 over last week’s figure and above the forecast of 551,000. For Canada the main item of news due shortly is the BOC monetary policy report which is followed shortly afterwards by the BOC press conference 45 minutes later. The press conference is generally split into two halves, the first of which is a pre-prepared statement, which is then followed by press questions. The questions often lead to unscripted answers that create heavy market volatility. The press conference is audio web cast on the Bank of Canada site.